Wetherspoons has been making waves of late. Often cited as the ultimate in pub blandness, it’s the chain’s peculiarities that have been garnering recent press. Intrigued by their empire expansion, outspoken founder and unique interior design, we set out to discover the oldest of them all: Stokey High Street’s Rochester Castle. A pub – the original was named the Green Dragon – has reportedly stood here since the beginning of the 18th century, a welcome stop on this busy, ancient thoroughfare. Hailing from Rochester (see what he did there? ), a Mr Richard Payne built the Castle in the early 1800s. Haunt of anarchists and punks in the late 1970s, it opened as a ‘Spoons in 1983. Pausing to note the mosaic welcome step, our eyes were peeled for a swirl of gaudy Axminster, primed by Hackney resident Kit Caless’s catalogue of Wetherspoons’ famed floor-coverings. The patches of threadbare pattern were a slight disappointment. The high-ceilinged, expansive pub retains some beautiful features, however, held aloft by slender cast-iron columns. 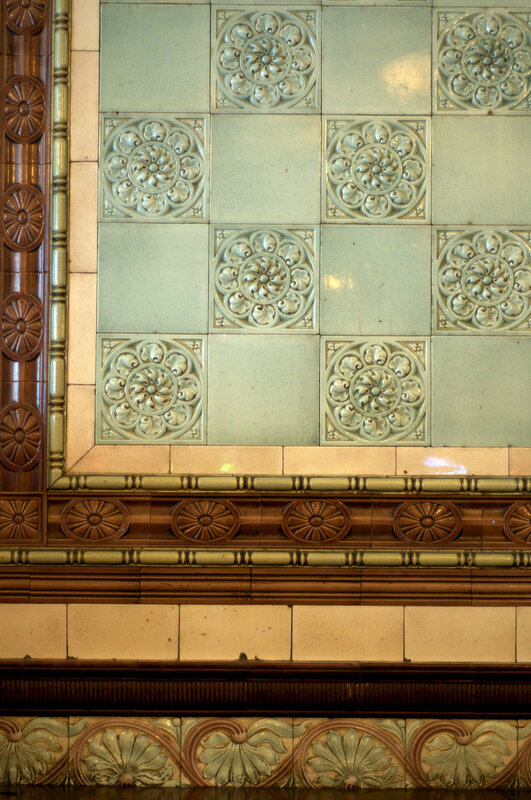 On both sides of the entrance, gorgeous glazed tiles recall the era of London’s gin palaces, and snippets of Hackney history dot the walls, alongside a portrait of erstwhile local Daniel Defoe. The long bar on the northern side holds an impressive selection of good-value drinks. Carlsberg and Carling line up against the more crafty Sambrooks and Sixpoints, while small-batch Portobello Road and Broker’s gins rub shoulders with ‘cocktails’ such as Smirnoff & Monster. Postmen, teachers, hippies and hipsters, students and service-users from the nearby homeless charity – the Castle caters to all. Music-less, as all ‘Spoons are, the pub hums with conversation and the murmur of televised sports. Groups tuck into an impressive array of bargain dishes, while loners nurse their pints and stare into the middle distance. A curious combination of the crestfallen and the clamorous, the Rochester Castle is a great place to meet a true cross-section of Hackney locals – one of the borough’s few unusually diverse drinking holes. So, Hackney: come one, come all – but most importantly – come just before pay day.